I’ve always been a fan of Martha Stewart and all things Martha Stewart Living Omnimedia-related. I sometimes say that Martha taught me how to cook. I was reading Living magazine, watching the Martha Stewart show (an early version), and reading her books when I first started getting addicted to cooking and learning new things about food. And, I get that she’s not everyone’s cup of tea. The endless jokes about her perfectionism never fail to amuse, but that’s actually what I’ve always loved about her. She’s explained before that first and foremost, she’s a teacher. She wants to present precise information and best practices for everything she demonstrates, and I appreciate that. So, I like Martha, classic Martha. In recent years, Living magazine has become simplified in comparison to early issues. Recipes have become mostly of the “quick” and “easy” variety, and the information has been pared down. I miss the in-depth nature of the old issues, and when I look back at pages I’ve clipped and filed over the years, the old ones still grab my attention. In 1999, I was delighted to bring home a copy of Martha Stewart's Hors d'Oeuvres Handbook which at the time was a recreation of the book Martha Stewart’s Hors D’Oeuvres from 15 years earlier. The 1999 version is a beauty with a section of color photos for all the recipes before the recipes themselves. Some items are easier to make than others, but everything is beautifully presented and made special. Now, a brand new book has been created. It’s Martha Stewart's Appetizers , and I received a review copy. Did you notice the change in title? It became simpler. The whole book is simpler with fewer sections and a more straightforward layout. There aren’t nearly as many fussy, little, perfectly cut-out shapes as seen in the previous book. But, it’s still from the Martha team. Everything looks delicious and pretty, and every single appetizer in the book had me imagining when and how I might serve it. This book has everything from Pigs in Blankets to Blini with Creme Fraiche and Caviar. There’s even a whole section for cocktails. I fell for the Pureed Soups because of the photo. Little cups of different types of soup are lined up in a rainbow of colors with beet soup next to butternut squash soup right by spinach-pea soup and so on. And, there are suggested garnishes like herbed croutons and roasted pepitas to serve with the soups. The mini quiches are adorable as are the Croque-Monsieur Bites. And, the Tostones with Crab Salad are at the top of my to-try list. There’s even an old-school Hot Artichoke Dip and a Hot-Crab and Pimento-Cheese Spread. Because I had a few local sweet potatoes sitting on my kitchen counter, I decided to dive in to Fried Sweet Potato Ravioli first. Baked sweet potatoes were cooled, and then the flesh was spooned into a food processor and pureed with heavy cream, grated parmesan, and salt and pepper. Wonton wrappers were each filled with two teaspoons of the sweet potato puree, and the edges were brushed with egg wash. The wrappers were folded over into triangles, and the edges were sealed. 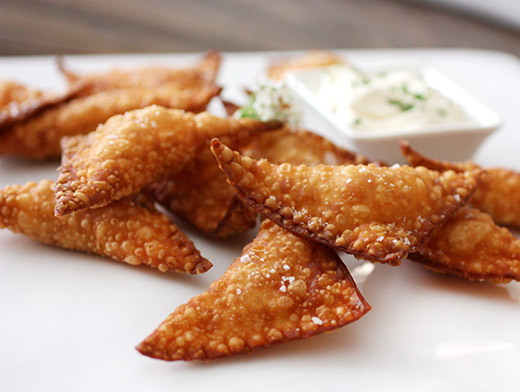 Working in batches, the filled wontons were fried a few at a time for about two minutes per side. The fried ravioli were served with sour cream topped with chopped chives. Yes, this new book is simpler, and I chose a pretty simple recipe to make from it, but I loved them both. The streamlined approach hasn’t lost me, but I enjoyed the more complex style too. These crispy ravioli dipped in the cold sour cream were delightful. I have some leftovers in the freezer that can be warmed and re-crisped in the oven some other day. Now, I need to plan a party or two and make several more things from the new book. Recipe reprinted from Martha Stewart's Appetizers . Copyright ©2015 by Martha Stewart Living Omnimedia, Inc. Photos by David Malosh. Published by Clarkson Potter/Publishers, an imprint of Penguin Random House LLC. Using wonton wrappers instead of pasta dough eases the preparation of this savory starter, and results in a crisp, light crust. The ravioli are also a great make-ahead option; reheat in the oven when ready to serve, as a toasty prelude to a cold- weather meal. 1. Preheat oven to 400°F. Prick sweet potatoes all over with a fork. Roast on a rimmed baking sheet until tender, about 1 hour. When cool enough to handle, scoop out flesh and transfer to a food processor. Pulse with heavy cream and cheese until smooth. Season with salt and pepper. 2. Working with one wonton wrapper at a time, place 2 teaspoons sweet potato filling in center of square. Lightly brush edges of wrapper with egg wash. Lightly press edges to seal. Using a small knife, make small decorative cuts along edges, if desired. 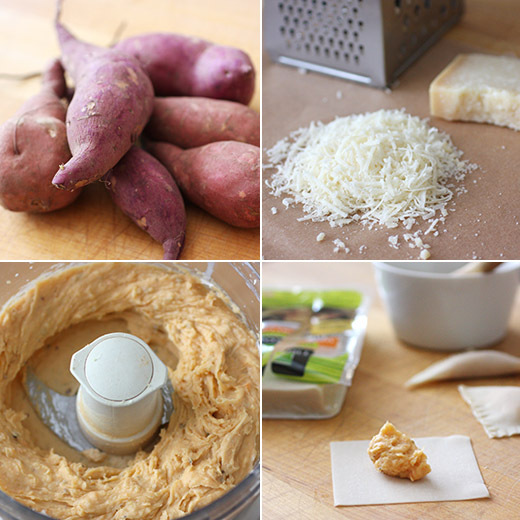 Transfer ravioli to a parchment- lined baking sheet and cover with a kitchen towel. 3. Heat 2 inches oil in a heavy- bottomed pot over medium- high until 350°F on a deep- fry thermometer. Line a wire rack with paper towels. Working in batches, cook ravioli until golden on the bottom, 1 to 2 minutes; flip and cook until other side is golden, 1 to 2 minutes more. Use a slotted spoon to transfer to lined rack to drain. Return oil to 350°F between batches. 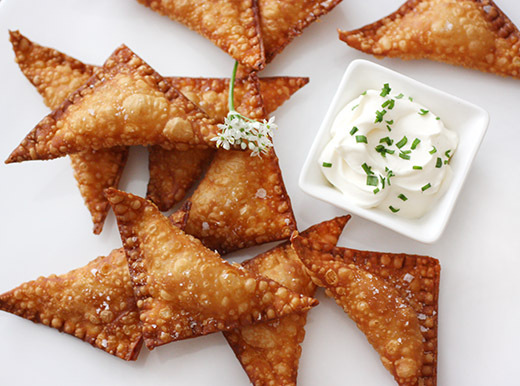 Serve immediately with sour cream topped with chives. MAKE AHEAD Arrange cooked and cooled ravioli in a single layer on a rimmed baking sheet. Freeze until firm. Transfer to a resealable plastic bag and freeze up to 3 months. Reheat on a parchment- lined baking sheet (do not thaw) in a 375°F oven, about 10 minutes. NOTE To keep them warm while you finish frying batches, place ravioli on a parchment-lined baking sheet in a 225°F oven. Every time I talk about the book On Top of Spaghetti I point out that I don’t play favorites with my cookbooks, but it’s one that is particularly special. It’s all pasta on every page, and everything I’ve made from it has been fantastic. Today, I won’t be talking about that book but instead about its authors and their first book. For years, I’ve been meaning to get a copy of Cucina Simpatica by Johanne Killeen and George Germon because of how much I enjoy On Top of Spaghetti. For that matter, their restaurant, Al Forno, is the reason Providence, Rhode Island has been on my list of places I want to visit. I still haven’t made it to Rhode Island, but I finally ordered Cucina Simpatica which was originally published in 1991. This one is more than pasta. It covers all of the Italian-based food they serve at Al Forno from starters and salads to pizzas, pasta, braises, and vegetables. And, now I have a new reason to want to visit their restaurant. I learned that most of their desserts are made to order including the ice cream that’s churned fresh for each customer. I checked the website, and their menu states that they continue to do this. Obviously, they have a knack for hospitality and an understanding of how to make really good food. As I was reading this book and choosing what to make from it first, our CSA box arrived. We received big ears of corn, pretty ripe tomatoes, and cucumbers. 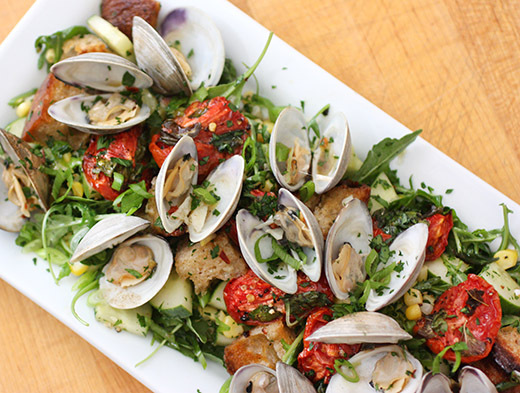 That helped me decide to try this Spicy Clam Salad. Making the salad requires pre-prepping a couple of items, but it all comes together simply for serving. First, oven-cured tomatoes were made. In the book, they suggest slow-roasting cored, whole tomatoes at 200 degrees F with basil or parsley and olive oil for eight to twelve hours. I took a quicker route by quartering the tomatoes, increasing the temperature, and giving them two hours in the oven. The flavor was concentrated and delicious. Meanwhile, hot pepper-infused olive oil was made by combining olive oil, paprika, crushed red pepper flakes, and garlic in a saucepan and simmering for 10 minutes. The pan was removed from the heat and left to infuse for 30 minutes before being strained. Next, the corn was cut from the cobs and cooked, and croutons were made with melted butter and garlic. The last thing to cook was the clams. They were steamed with white wine and water, and I added more crushed red pepper flakes. To complete the salad, the corn, croutons, chopped cucumbers, some sliced green onion, arugula, and parsley leaves were tossed with red-wine vinegar and the spicy olive oil. 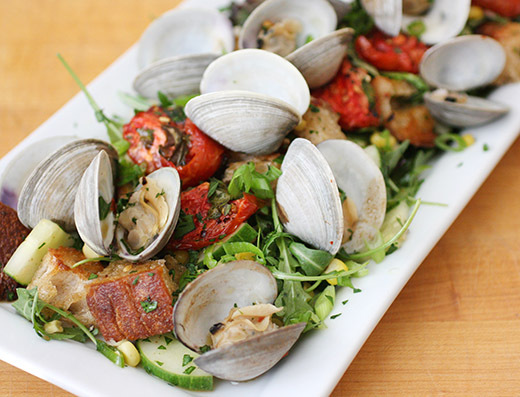 That was arranged on a platter, and the salad was topped with oven-cured tomatoes and the steamed clams. 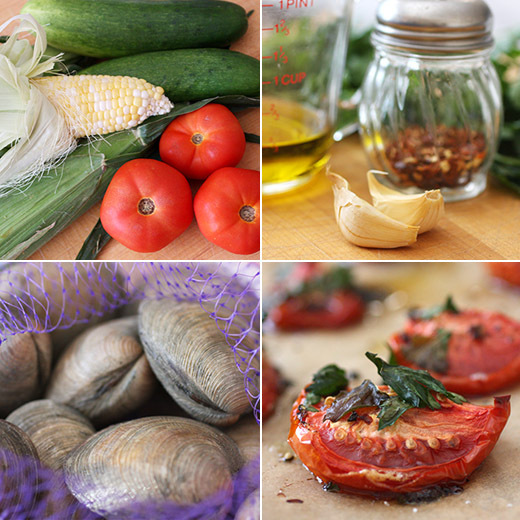 Fresh corn and clams always go nicely together, and all the other ingredients were like summer’s greatest hits. I always like clams, but this instantly became one of my favorite uses of them. Once again, Johanne Killeen and George Germon did not disappoint. I’m delighted to have another book of theirs to cook from, and I’d love to see a new one from them too. I really have been trying to consume less sugar lately. When I bake sweet treats, they get quickly whisked away to be shared with lots of people leaving none behind to tempt me at home. And, I haven’t been making ice creams or sorbets this summer like I usually do. 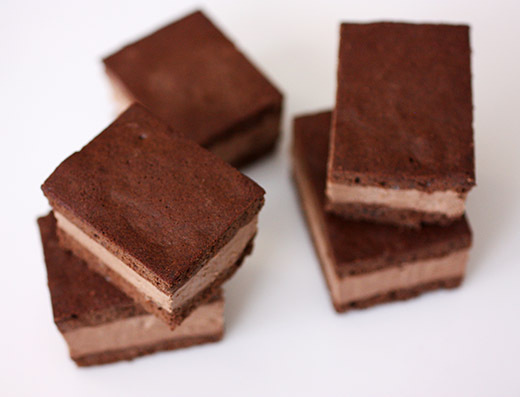 But, then I remembered these ice cream sandwiches from Joanne Chang’s Baking with Less Sugar . They’re found in the amazing chocolate chapter in which none of the recipes contain any added sugar. The only sugar in these chocolate treats comes from that found in the chocolate itself. I marked this page when I read the book, and it was time to put them to the test. The first thing to mention is that this isn’t churned ice cream in the sandwiches. 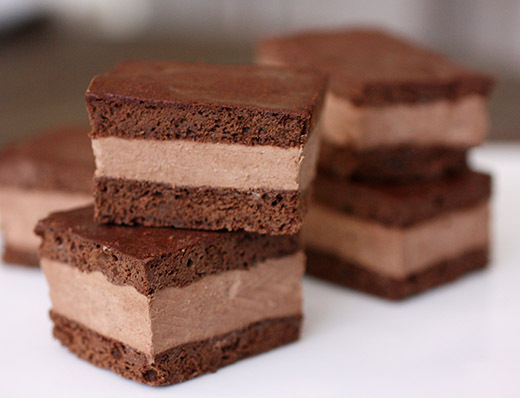 It’s actually a whipped chocolate ganache that gets spread between thin cake layers and frozen. There are a few steps that require waiting, chilling, or freezing before continuing, but each part is simple to do. You begin by making the “ice cream,” and letting chopped mint steep in warm cream for 30 minutes. After steeping, the mint was strained from the cream, the cream was brought back up to a simmer, and then it was poured over some chopped bittersweet chocolate. The chocolate-cream mixture was whisked until smooth before it was covered and chilled overnight. Next, the thin cake was made. More bittersweet chocolate was melted in a double-boiler. Egg yolks, coffee, and salt were whisked into the melted chocolate. 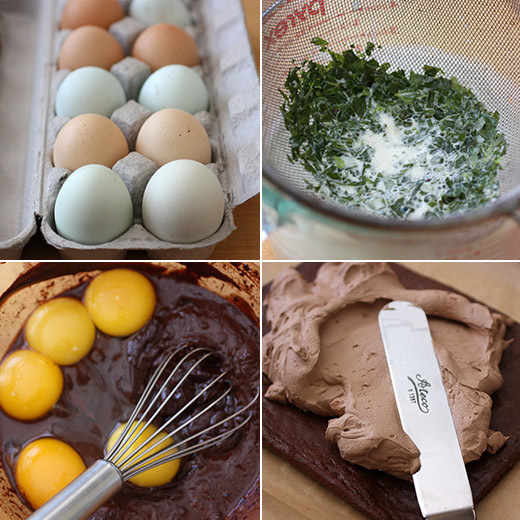 Egg whites were whisked in a stand mixer until firm peaks were formed. The whites were folded into the chocolate mixture in two stages, and then a scant quarter cup of flour was folded into the batter. The cake batter was spread onto a parchment-lined baking sheet, and it was baked for about ten to twelve minutes just until dry to the touch. After the cake cooled on a rack for 30 minutes, it was wrapped with plastic wrap and left in the freezer for a minimum of 30 minutes. The cake was removed from the pan and cut in half widthwise and set aside while the chilled ganache was whipped until fluffy and it held stiff peaks. The whipped ganache, or ice cream, was spread on one half of the cake, and the second half was placed on top and pressed to make flat. The sandwiched cake was then covered again and placed back into the freezer overnight. I wasn’t kidding about lots of waiting between steps. Last but not least, the big cake sandwich was cut into portions. The ice cream layer and the cake were both surprisingly tasty given that there was no added sugar in either. However, because of the sugar absence, the ice cream does freeze to a very solid state. It’s a good suggestion in the book to let them sit at room temperature for a few minutes before serving. There were no issues with the cake though. It was a tender and perfect way to sandwich ice cream. And, of course, the mix of chocolate and mint was meant to be. This got a thumbs-up for a treat that wasn’t too sweet.